What was your favorite story in Brick of Mormon Stories? What do you like best about the book? Share your feedback on Brick of Mormon Stories and the impact of the book on yourself or your children. Any Ideas for Making Scripture Study a Habit? One of the biggest challenges to having daily family scripture study is setting aside time and making it a priority for the whole family. This has been especially hard with younger children. What have other families done to make that goal a reality? Where did Brick of Mormon Stories Come From? 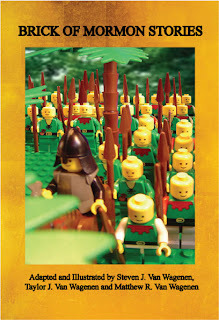 I never really intended to publish a LEGO-illustrated book of stories based on the Book of Mormon. Yes, LEGOs are fun. And, yes, The Book of Mormon is an amazing book of scripture; which I testify is true. However, the two never seemed to meet in my mind until a few years ago. I wondered how playing out some of the Book of Mormon stories with my boys using LEGOs would compare with all of the other ways we can teach our children the stories from the Book of Mormon. The thought came into my mind that there should be a children's book that uses actual scripture verses to tell the story, illustrated in such a way that children could find a way to bring the stories to life. I wanted something that would help my boys learn how to read the scripture text and still have the fun illustrations. In the long run though, I feel there is a deep need for us to apply the principles and teaching of the gospel of Jesus Christ to our lives. We need to help our children internalize the gospel earlier in their lives so they can go forward with faith and a testimony into the world. One of the ways to do that is by involving the gospel in some of their playtime activities and constantly helping them see ways that the gospel applies in their lives. While LEGOs may not be everyone's "thing" we hope is that our idea of likening the scriptures to ourselves will stimulate some ideas on how we can help our children apply the gospel in their lives. We hope you enjoy Brick of Mormon Stories. Please share your thoughts on the book or other resources you have used to help your children gain a love for the scriptures and the gospel of Jesus Christ. Your experiences may help other families that are trying to find something that works for them.